The QAUTO-OHM 200 S3 is Amperis’ fourth generation, microprocessor-based, true DC micro-ohmmeter. It is designed for testing EHV circuit-breaker contact resistances, bushing contact joints, welding joints, or for any low-resistance measuring application. This high current and very lightweight (16.8 lbs/ 7.6 Kg) micro-ohmmeter is designed to meet the IEEE C57.09-1999 (5.15) requirement for testing circuit breaker contact resistance. The QAUTO-OHM 200 S3 can accurately measure resistance values from 1 microohm to 5 ohms. A 0.1 micro-ohm resolution is possible with current greater than 5A. The QAUTO-OHM 200 S3 applies a selectable true DC test current from 1A to 200A to the resistance load to be tested. The QAUTO-OHM 200 S3 controls the test current’s rise and fall rates. The test current rise and fall rate can be selected from 5 seconds to 30 seconds. An “Auto Test” mode is also available and can be initiated simply by applying the sense cables’ leads across the two points of interest in the current path. This feature is very convenient when measuring a sequence of several resistance values in a circuit breaker contact. The QAUTO-OHM 200 S3 can also compare test results against preset limits and determine if a test passed or failed, and a “Pass” or “Fail” flag is displayed accordingly. Since a true DC current (with controlled rise/fall time) is passed through the circuit breaker contact, no magnetic transient is induced into the breaker’s current transformers. This feature greatly reduces the risk of inductively tripping a breaker control (bus differential relay). With the Dual Ground option, the QAUTO-OHM 200 S3 can also measure the circuit breaker contact resistance with both sides of the breaker bushing being grounded. When a test current is applied to a circuit breaker with both sides grounded, some of the test current flows through the safety ground cables. Using an external current sensor, the QAUTO-OHM 200 S3 measures and eliminates this current from the total test current. The Auto-Ohm then calculates the actual resistance value of the circuit breaker. The QAUTO-OHM 200 S3 can store 128 records of 64 readings internally, and up to 999 test records on an external USB Flash drive. Test header information (Company, Substation, circuit breaker ID’s) can also be entered using the 44-key keypad and is stored with each test record. The QAUTO-OHM 200 S3 features a back-lit (128 x 64 pixels) LCD screen that is viewable in both direct sunlight and low-light levels. The resistance readings are displayed on the LCD screen in micro-ohms or milliohms. The unit is operated via a convenient 44-key “QWERTY” keypad on the front panel. The QAUTO-OHM 200 S3 is furnished with a 30-ft test cable set. A 15-ft test cable set is also available as an option. Test cables are terminated with heavy duty welding type clamps. The test current and voltage sense cables are isolated and fastened to the clamp jaws. This feature allows for a simple connection to the circuit breaker bushing. An optional voltage sense cable and probe can be used to measure resistance in small access locations. Optional heavy duty, welding type C-clamps are also available allowing the user to connect the test leads to a wide variety of bushing sizes, bus-bars, or large conductors. The contact resistance tester is one among many quality products manufactured by Amperis that could be especially useful in gathering relevant info of the health of various components within an installation. Even with a good HV circuit breaker, periodic checks are part of the routine within, any power transmission/generation installation. Poorly maintained or damaged contacts can lead to single phasing, arcing and even fire, hence the importance of performing regular checks with accurate measuring equipment. This particular product is very lightweight and microprocessor based and can test contact resistance, busing contact joints or any low resistance measurement. It can also test the rise and fall rate of current and can store data for over 100 tests (useful for keeping track of wear and tear of components). 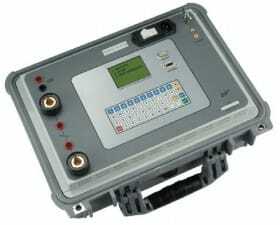 The unit has a large and easy to operate QWERTY interface with an easy to read LCD screen that is readable even in bright sunlight, plus a 30ft test cable among other useful features.